Hard to believe “The Mask of Zorro” just turned twenty years old. It doesn’t seem like that much time has gone by. The film starring Antonio Banderas, Anthony Hopkins, and Catherine Zeta-Jones and directed by Martin Campbell was a big deal for me. I had been a Zorro fan most of my life, but this would the my first chance to see Zorro on the big screen. I still remember going to see the movie the first Sunday it was out. My friend John and I wanted to see the first show of the day at the National Amusements theater in Randolph Ma, but it was sold out. We managed to get tickets to the 2:00 show, but even that was packed and we ended up sitting in the last row. We sat so far up, that we had to use a different door to get into the theater. Luckily the sitting arrangement did not take away my enjoyment of “The Mask of Zorro.” This movie was everything I wanted to see and so much more. The film not only reintroduced the character to new generations, but it expanded on what had been done before. “The Mask of Zorro” had a lot of energy, fun, swordplay, and humor. I never felt like the movie talked down to long time fans, or tried to preach at you. The movie simply showed you how good can battle evil, with honor. My favorite scenes in the movie were the ones between Antonio Banderas and Catherine Zeta-Jones, who had great chemistry and, an ideal to the right thing. Whether its the dance at Don Rafael’s hacienda, at which the daughter and the dashing visitor take over the dance floor in a passionate paso doble. Or a scene that starts as a duel to the death between man and woman, and ends in a surprised embrace. All of their scenes together were gold. As John and I left the theater, I couldn’t stop raving about the movie. Then as we rode the escalator up, we saw going down were the rest of our friends. They were on their way to see “Armageddon,” which John and I had already seen. But they said we should come along anyways, so we did. Afterwards I told them about “Mask of Zorro,” and Nick suggested we go see it. I couldn’t say no, so off we went to see the movie once more. When I was around five or six years old, I got sick at school, and had to stay home the next day. I spent most of the day sleeping, but woke up every few hours to take my medicine. It was during one of the medicine breaks when I turned the tv on and discovered Disney’s 1950’s “Zorro” series starring Guy Williams. I changed the channel just in time to see Zorro jumping from a rooftop. I didn’t know who the masked man wearing black was, but I definitely wanted to know more. It only took one scene to make me a fan. And as I recovered over the next couple of days, I made sure to catch more episodes of Zorro. That was a long time ago, but my love of Zorro has remained intact. Since that day in the early 1980’s, I’ve watched every Zorro tv show and movie I could find. I’ve read the original story by Johnston McCulley countless times. Aside from the Guy Williams show, I’m particularly fond of the 1940 film “Mark of Zorro” starring Tyrone Power. But my next favorite Zorro adaptation is none other than the “Mask of Zorro.” And the memories o seeing the movie probably have a lot to do with that. For the sequel, Rodriguez had a bigger budget, and a cast that included young actors Antonio Banderas and Salma Hayek. But getting to see “Desperado” on the big screen, wasn’t easy For my friends and I. A group of about 7 of us had planned on seeing “Desperado” one Thursday afternoon at the Harborlight Mall in Weymouth. In the group were Laneit, Wah Kee, Jim, Chris, another Chris, and a couple of other kids that were friends with the second Chris, and of course me. Since the movie was rated R, the plan was for me to buy everyone’s tickets. See, out of everyone planning to go, I was the only one that was 17. But at the time I didn’t have a license yet, just a drivers permit, and the girl at the counter said that wasn’t good enough. We could have thrown a tantrum in the middle of the lobby, but Laneit had a better idea: his dad worked across the street. He can come buy us the tickets. People in the mall parking lot probably thought we stole something as they saw us running across the lot headed towards the Uhaul center where Laneit’s dad worked. Once there, we found Laneit’s dad was on his break, but we managed to convince him to come back with us and tell off the girl at the movies. Not really, we didn’t ask him to do that, I’m only joking. We explained what happened and he agreed to buy the tickets for us. Bakc at the ticket counter, Laneit’s dad said he needed tickets for all of his children. You should have seen the girl’s face! She said something like “Your kids?” and Laneit’s dad replied, “Yes, these are all mine.” Why was this funny you may ask? That scene is what I remember the most about that day. Could I tell you what happened in “Desperado”? Nope, I don’t remember too much about the plot. All I do remember was Antonio Banderas singing, and Salma Hayek getting nekkid. But I don’t remember what was going on around them. But that’s okay, because at least something fun happened that day. 33 miners entered the San Jose copper-gold mine in Chile’s Atacama Desert on August 5th, 2010. None of them knew they would be trapped that afternoon when the 121-year old mine collapsed all around them. Buried 2,300 feet under the earth, the miners managed to take shelter in the mine’s “refuge” room which housed emergency rations and medical supplies. Unfortunately, the refuge room was poorly stocked, and only intended to accommodate 30 workers, forcing the trapped miners, led by shift foreman Luis Urzúa (Lou Diamond Phillips) and Mario Sepúlveda (Antonio Banderas), to carefully allocate food and water, extending their survival for as long as possible. Meanwhile above ground, news of the mine collapse reaches Chilean Minister of Mining, Laurence Golborne (Rodrigo Santoro) as well as the Chilean President Sebastián Piñera (Bob Gunton), and the pair immediatly start a rescue effort. But given instability within the mine, as well as logistical challenges of locating, much less recovering the trapped miners, the Chilean government must call upon the best engineers, medical professionals, and drilling teams from across the globe to assist in one of the most complicated rescue attempts in world history. Based on the book “Deep Down Dark: The Untold Stories of 33 Men Buried in a Chilean Mine, and the Miracle That Set Them Free” by Los Angeles Times writer Héctor Tobar, “The 33” was brought to the big screen by Mexican director Patricia Riggen. Now, I knew the basic story of the miners before watching the movie, but I did not know many of the details. As with most biopics, I’m guessing Riggen took a few liberties with the real San Jose mine story. But even if she did make changes, “The 33” was still a wonderful film. The San Jose mine story made for a stirring drama, shedding light on what the 33 miners went through during their lengthy ordeal in 2010. The film is filled with tension, drama, humor, and joy. And even though you just met these miners, you feel invested in what happens to them. “The 33” also delivers quality performances from the cast (both above and below ground), with standout work by Antonio Banderas, Rodrigo Santoro, and Juliette Binoche. Antonia Banderas is charming as the film’s central protagonist, Sepúlveda, He serves as the movie’s (and the miner’s) “leader” figure. Throughout “The 33” Banderas never loses his enthusiasm or his hope for a rescue, and as a viewer, I loved that. Banderas also has some of the best one liners in the movie. The film depicts complicated relationships with a gentle hand. Many of the movie’s best scenes occur in moments of tenderness, compassion, or shared grief. My favorite scene was the miner’s “Last Supper” which was strangely sad and funny at the same time. Never did I expect a movie like this to be as funny as it was, but you know what? It worked. Is “The 33” the greatest drama I’ve ever seen? no, but if nothing else, the film succeeds in educating the audience on the situation as well as offering insight into the friendships, partnerships, and relationships that kept these 33 alive for so long. This weekend, three new films tried to break into the top ten, but it was last weekend’s releases repeated at the top of the box office by a large margin. I hope my insurance covers this. The latest James Bond film, “Spectre,” stayed strong in its second week in the States, with an estimated $35.4 million for only a 49.7% drop from last week. That’s the smallest week two franchise drop since 2006’s “Casino Royale.” With $35.4 million, “Spectre” has earned over $130 million domestically. As impressive as that is, its overseas where 007 is making the most loot. After breaking records in the U.K., the film took in an estimated $48 million in China this weekend. If that number holds, then “Spectre” is well on its way to crush the $59 million “Skyfall” made during its entire China run. “Spectre” now sits at $543.8 million worldwide, moving it into the top ten for the year. Staying in second place from last weekend is “The Peanuts Movie.” The film finished with am estimated $24.2 million. putting the film at $82 million domestically. Overseas, however, the Peanuts gang haven’t made much of an impact. Opening in only twelve territories so far, Snoopy and friends have generated only $8.1 million, including a disappointing $4.2 million from China after two weeks in release. The animated film still has one more weekend to itself to make as much as it can before Pixar’s “The Good Dinosaur” starts printing money and stealing audience’s animated attention. Third place is where we find the week’s first newcomer in CBS Films’ and Lionsgate’s “Love the Coopers.” Performing better than some predicted, the holiday, family feature brought in an estimated $8.4 million from 2,603 theaters. The “B-” CinemaScore doesn’t suggest a strong audience response, but being the only holiday film in wide release at the moment it should have a decent, but short, theatrical run. Finishing in fifth place was Warner Bros. “The 33,” which kicked off its theatrical run with an estimated $5.8 million. 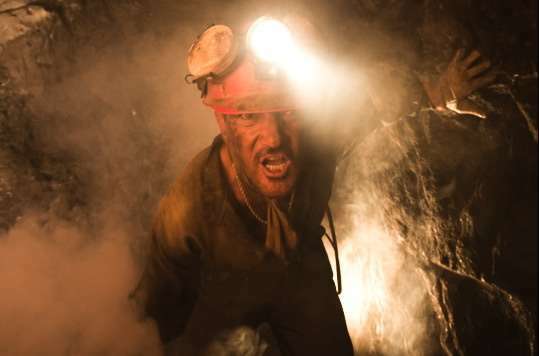 Headlined by Antonio Banderas, the Chilean miner drama didn’t seem to click with audiences, despite its solid, “A” CinemaScore. I blame a less than stellar marketing campaign. From there we have to scroll wat down the charts to find Angelina Jolie’s “By the Sea.” The film was written, directed by and stars Jolie alongside her husband, Brad Pitt. The ’70s set tale about a disintegrating marriage managed only $95,440 on ten screens. Budgeted at a reported $10 million, Universal still plans to expand the film’s release into 120 theaters next weekend. Perhaps VOD or Netflix would be better. Anywho, next weekend sees the release of “The Hunger Games: Mockingjay – Part 2” into 4,000+ theaters. The Hunger Games finale should easily trounce the holdovers, but will it top the $121.8 million opening Part 1 brought in just last year? Stay tuned kids, stay tuned. I think this movie looks amazing, and it has an excellent cast. Plus I enjoy watching movies based on true stories. And I don’t have a problem with the movie being in English, it makes sense for a few reasons. But I don’t understand why the place cards in the trailer are in Spanish. Not that it affects me much as I’m fluent in Spanish. I just found it odd. “Los 33” is scheduled for release later this year. The big screen’s Zorro and the X-Men’s Mystique in a Brian De Palma movie. No way could I pass this up, but I should have. The music sets the tone for a $10 million diamond heist that’s about to unfold at the Cannes International Film Festival. But the diamonds aren’t locked away in some bank vault, instead, they’re encrusted on the serpentine brassiere of the gorgeous model serving as the date Régis Wargnier at the première of his latest movie. Posing as an aggressive paparazzo,Laure Ash (Rebecca Romijn Stamos) pulls off the heist by seducing the woman and liberating her of the jewels in a translucent bathroom stall. Her team includes the usual crew of heist-movie types, one guy makes his way down an air duct, another one assumes the role of a security guard, and still another lifts a key for the escape route. But the movie takes a turn when Laure Ash steals the diamonds not only from the model, but also from her fellow criminals. This is one long sequence, but it’s brilliantly done by director Brian De Palma. Now if I were you, this is where I’d stop watching “Femme Fatale,” because the rest of the movie is an absolute mess even by De Palma standards. Following the heist, Laure needs to get out of France fast. It’s a good thing she stumbles across her doppelgänger (also played by Romijn, but in a brunette wig) in a Paris apartment. Well, first Romijn takes a dip in her tub, but then the woman returns home. Lily, it seems, is distraught over losing her husband and child, so she commits suicide in front of Laure. This is good news for Laure because it leaves her with a ready-made identity switch, plus a passport, and even a ticket to the United States. Laure’s luck doesn’t stop there. She ends up in a first-class seat next to a wealthy American entrepreneur and statesman (Peter Coyote). Then, for no real reason, the film flashes forward Seven years. The statesman is now stationed permanently in Paris as ambassador, and Laure Ash is his wife. In other words, she’s basically returned to the scene of the crime. Even though, people are still looking for her. The ridiculousness of all of this is explained later, but I won’t bore you with those details, except to say I felt like Brian De Palma wasted a couple of hours of my time. 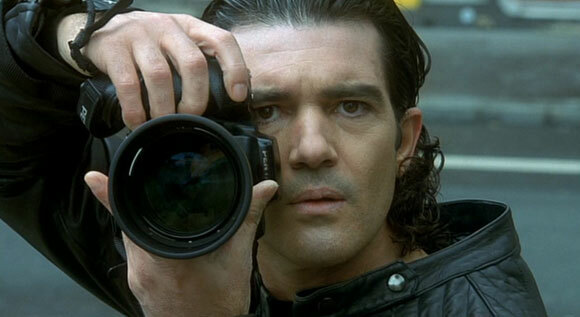 Things escalate for Laure when freelance photographer Nicolas Bardo (Antonio Banderas) snaps a picture of Laure, and after the shot circulates around the city, she becomes a target for the crooks she betrayed in Cannes. More stuff happens, like Laure doing a striptease for a stranger at a bar. She does this just to make Nicolas jealous and pit the two men against each other. Why? so she can a good laugh out of it. Brian De Palma was probably hoping for “Basic Instinct” like success, but “Femme Fatale” only earned $6,630,252 domestically. And judging by the final product, I’m guessing this movie cost a wee bit more than that.